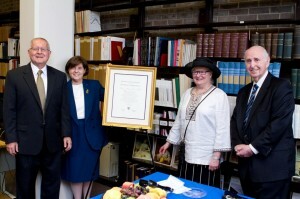 The Yeshiva University Archives recently acquired the Herbert S. and Rebecca Collection, thanks to a generous gift from Michael Jesselson, a member of the YU Board of Trustees. Mr. Jesselson’s gift continues his family’s tradition of enriching the library collections. Rabbi Herbert S. Goldstein (1890-1970) was a seminal figure in American Orthodox Judaism. He was best known as rabbi of the Institutional Synagogue, founded in Harlem in 1917, the forerunner of today’s West Side Institutional Synagogue. He and his wife, Rebecca (1891-1961), daughter of Harry and Jane Fischel, prominent Orthodox philanthropists and major contributors to Yeshiva College and the YU-affiliated Rabbi Isaac Elchanan Theological Seminary, were both active in the Orthodox Union (OU). 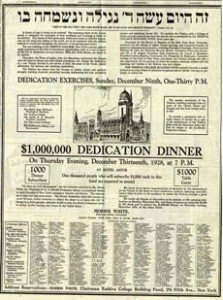 The support for the OU furthered the long-term growth of Orthodoxy in this country, as documented in the collection.